Finding the right school might be the most important decision you’ll make when beginning your journey to a career in the arts—but just as important is finding a school that boasts the right environment too. If you’re considering the Pennsylvania College of Art & Design as your school of choice, you may be wondering: What’s life at PCA&D like, and what fun things are there to do in Lancaster PA? Grab a seat and sit back while we paint you a word picture of everything Lancaster City has to offer PCA&D students. Lancaster City is a vibrant, welcoming art community on the upswing, thanks in part to the wide array of local galleries, coffee shops, music venues, and, of course, PCA&D. Having public transportation close to campus is also helpful. You can quickly catch a bus or train to take you anywhere, from the regional mall to Philly, New York City, or an international airport. Whether you’re looking to grab a coffee with friends or clear your head away from the hustle and bustle of campus life, there are a ton of options within walking distance. Adjacent to the PCA&D, Gallery Row on North Prince Street features over 40 galleries and artist studios. This thriving artistic community in Lancaster offers an eclectic mix of work from the world over—and gives PCA&D students a chance to exhibit some of their work in a commercial gallery setting. If you’re a music buff, you’re in luck! Original live music venues like the Chameleon Club or Tellus360 bring in headlining acts from across the country due to Lancaster City’s location as the hub connecting Philadelphia, New York City, Baltimore, and Washington D.C. Restaurants and cafés around town regularly feature live music acts as well, creating plenty of options for your nights out on the town. Lancaster City also hosts Music Fridays, which kick off every third Friday of the month. With countless performances and musical acts, the streets come to life as retailers, restaurants, and attractions open their doors to the community for a night full of can’t-miss musical fun. Lancaster City streets are lined with so many incredible restaurants, bars, and cafés, it’d take entirely too long to count them all! Whether you’re looking for fried pickles at Annie Bailey’s Irish Pub, artisan pizza at The Fridge, or a giant bowl of udon at Issei Noodle, you have plenty of options for that after-class hunger pang. There’s also Lancaster’s Central Market, the oldest farmers’ market in America. In operation for 120 years, it’s smack in the middle of town, less than a five minute walk from PCA&D. Central Market is open three days a week for fresh produce, flowers, meats, breads, cheeses, crafts, decorations, pastries, ice cream, candy—anything you could imagine. It’s the perfect place to do some food shopping for the week or grab a bite to eat for lunch. Central Market is an experience, and definitely a must-see destination for anyone visiting or passing through Lancaster City. One of the best ways to experience everything Lancaster City has to offer is by stopping by on First Friday—a city-wide celebration of the arts that takes place on the first Friday of every month. This celebration of our shared creative culture acts as a monthly dose of inspiration for students and faculty alike. All of Lancaster’s local art galleries and artists’ studios, along with shops, restaurants, and other venues get together for a night of art and entertainment. And PCA&D enriches the First Friday festivities by providing exhibitions of nationally-acclaimed artists at every possible opportunity. From gallery shows to street performances, the atmosphere is electric, and students always remark how exciting it is to be a part of such an involved, close-knit community. Most PCA&D students move into and live in Lancaster City, helping them quickly form relationships with gallery owners and other businesses as regular customers, exhibitors, volunteers, and interns. Lancaster City continues to provide more activities and events to local residents and students alike, constantly improving the quality of our community. 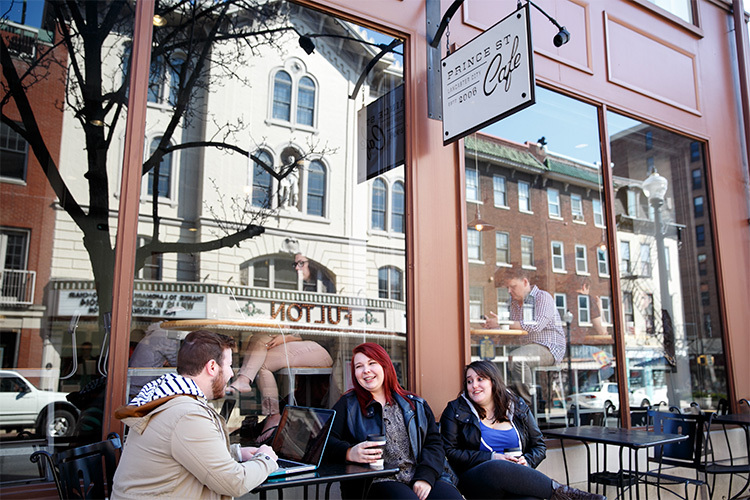 Lancaster City provides the perfect setting for your college experience. When you live here, it’s more than a zip code—it’s a home you’ll share and shape with your peers. PCA&D offers many opportunities to participate in campus programs throughout the day and night… which means you’ll want to be close by. And city living is easy in Lancaster. With most stores, entertainment, and housing within walking distance, you’ll have everything you need just a short distance away. If you’re looking for the true Lancaster City experience, there’s only so much you can learn from a blog. The best way to get a feel for the area and campus life is to visit us yourself!